It has been great running this travel blog during the past months. We had a lot of fun trying to reveal hidden corners of Greece. We would like to take this opportunity and to say big Thank you all for your messages and comments that encouraged us to keep on and finally to move on to our next challenge! We are in love with our home country as we also are with travelling outside of it. Therefore we decided that our quest to gather the best things in life should not be limited to one country. Instead we want to find people with the same passion and values and together uncover destinations all over the world. All of you seeking to experience the best things in your destination, we invite you to visit our new website where you can find our recommendations for old and new destinations. 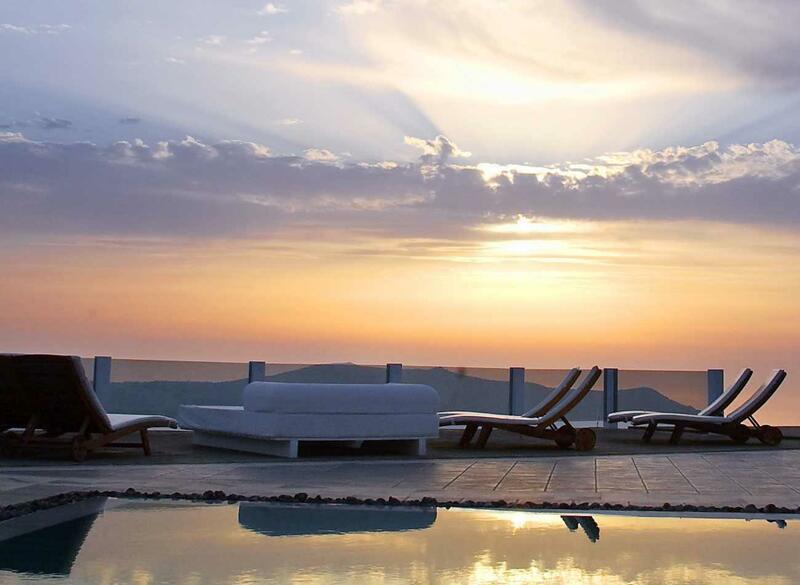 The top 5 hotel-room-views in Greece! A friend once wisely said that if you want to form an objective opinion for a destination, you must visit it at least three times during different seasons. I totally agree, only I would add just one extra parameter; perception, that according to some psychologists changes every 7 years on average. So, 1 destination, 3 times, different season each time, with 7 years in between… I am already starting to feel tired by doing the math! So let’s go on to something much more intriguing than mere mathematical operations! 1. Go by car. If you want to really familiarize yourself with the area and take as much as you can back with you, you should really go by car which will give you the flexibility to explore this mountainous place even more. 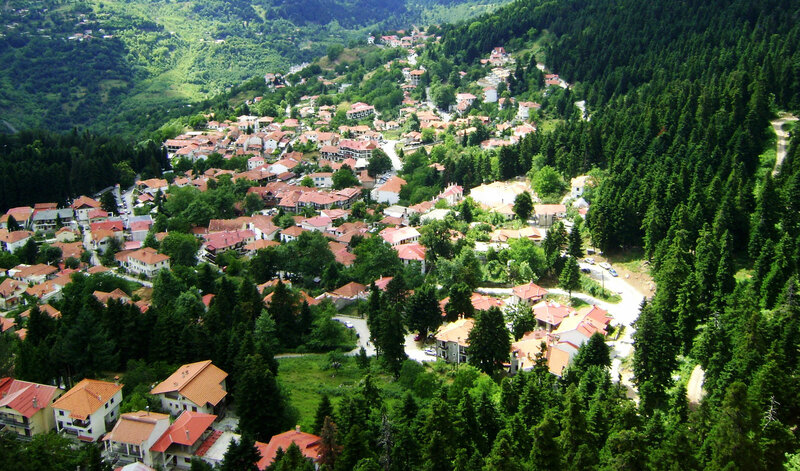 Elati is an amazing village itself but driving in the surrounding area will really take your breath away! 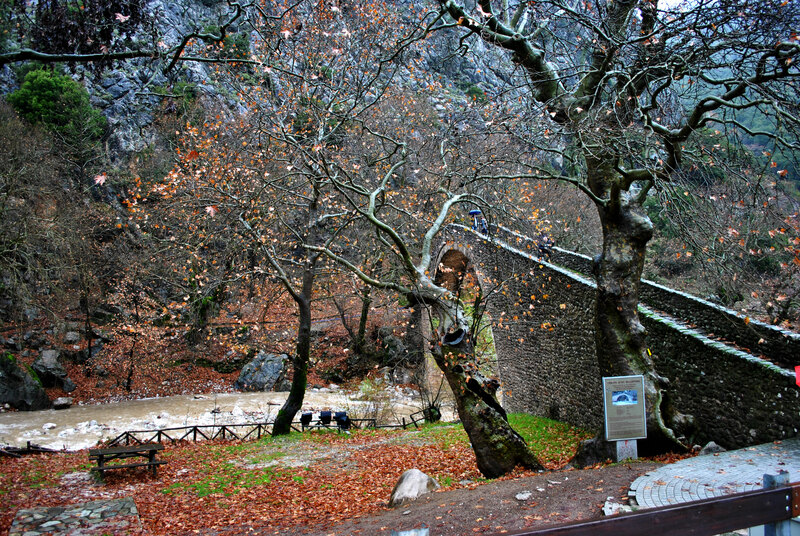 On your way up from Trikala take a few minutes and stop to admire the traditional bridge in the village of Pili. 2. 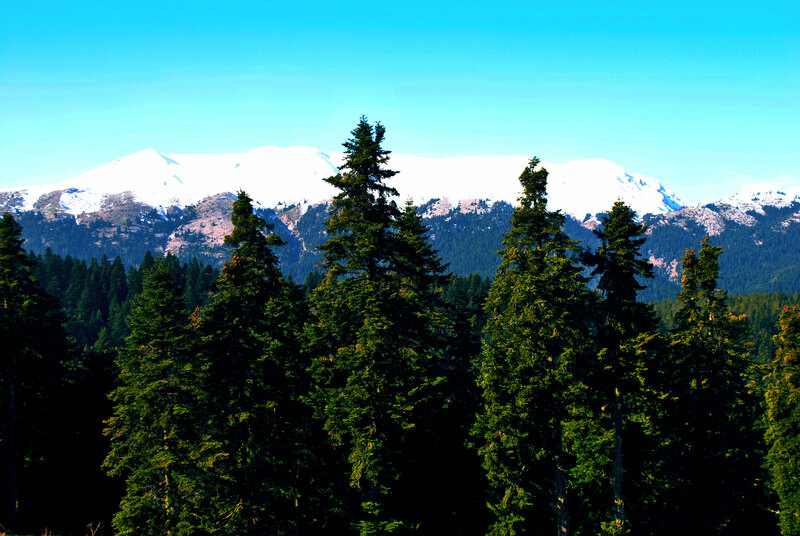 Don’t miss (1): Plastiras lake. 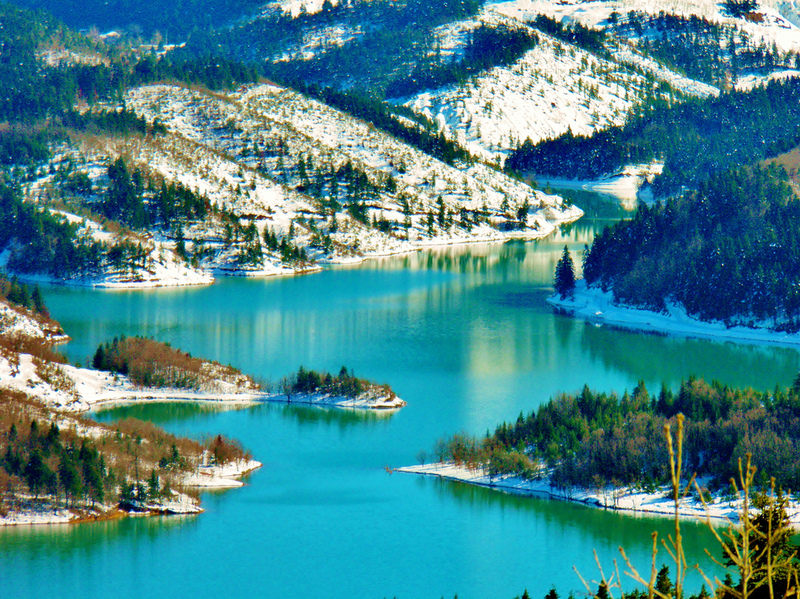 A few kilometres from Elati is the artificial Plastiras lake. 3. 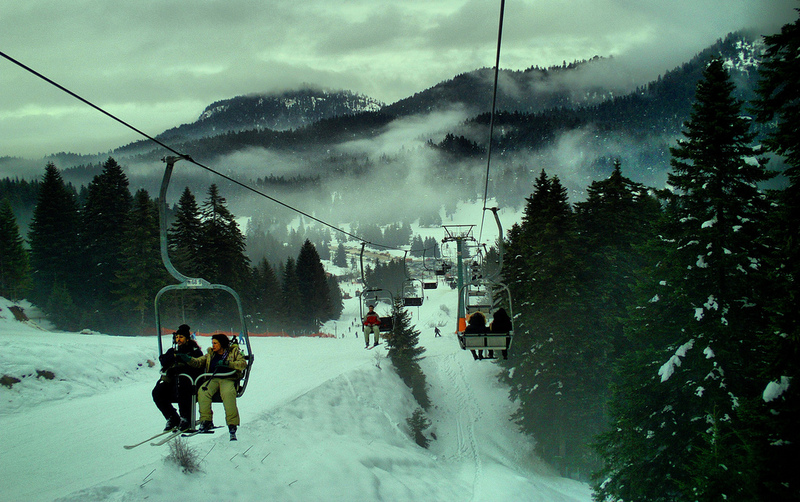 Don’t miss (2): Ski centre of Pertouli. 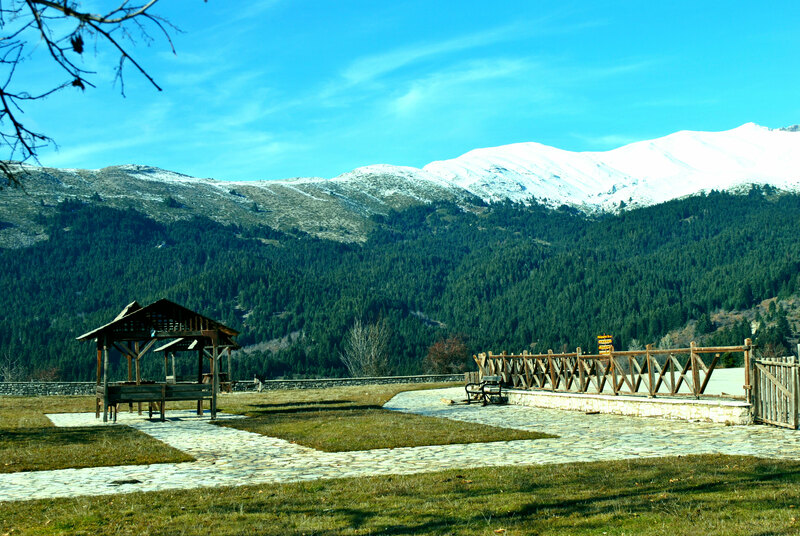 Continuing on the road after Elati and before reaching the nearby village of Pertouli, you will find the ski centre. Although it is a very small one, it is worth visiting as the view from the top of it is just amazing; you will have the chance to see the surrounding mountains, standing gloriously usually full of snow! 4. 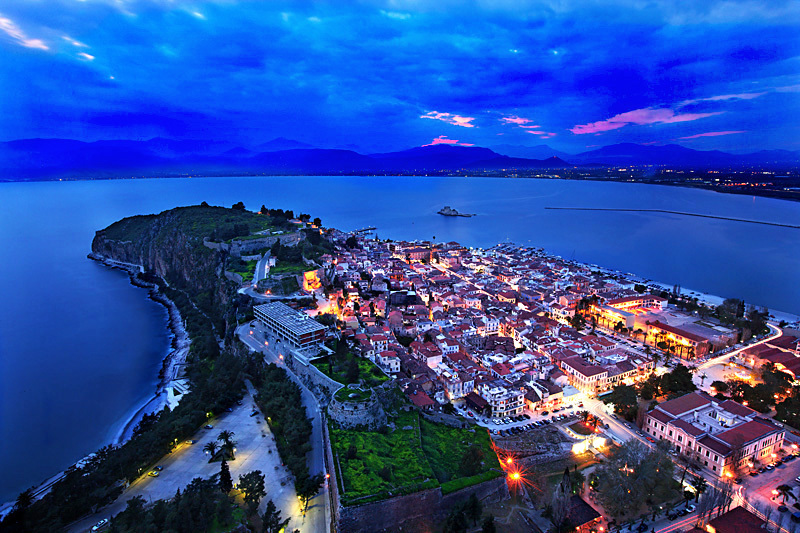 Continue even further down the road and visit Pertouli and Neraidochori! The magnificence of this area is not captured only in the villages of the area but also in the road connecting them! The views while driving are breathtaking! You will find many spots to stop and enjoy the view! 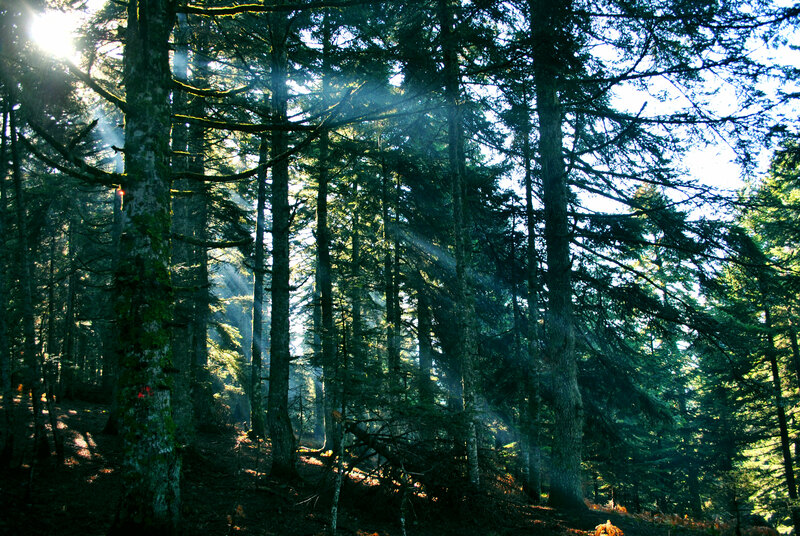 One of them is just after Neraidochori, where you will find a refurbished church and a great place to admire the nature! 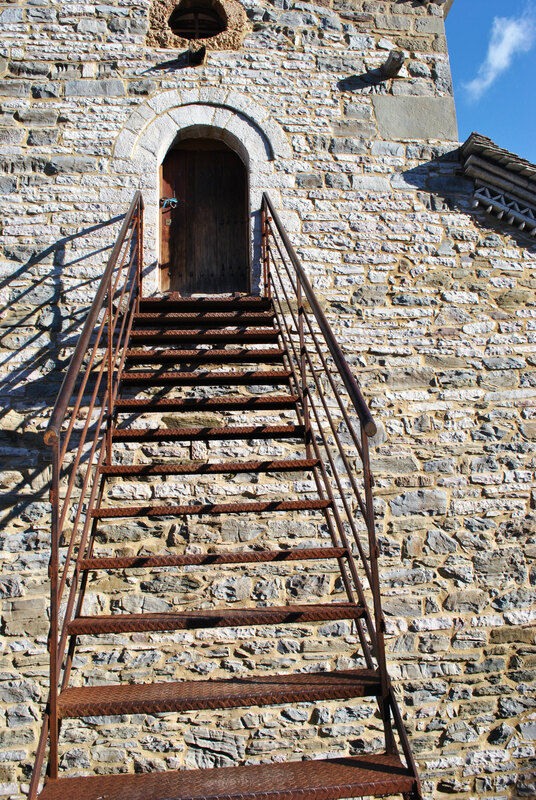 The back door of the church! Close to Pertouli you will find a restaurant called “Niavis”; a traditional spacious Greek taverna, with amazing view of the mountains and the surrounding area and excellent food; again a choice of many locals from the area! 5. Explore the area! 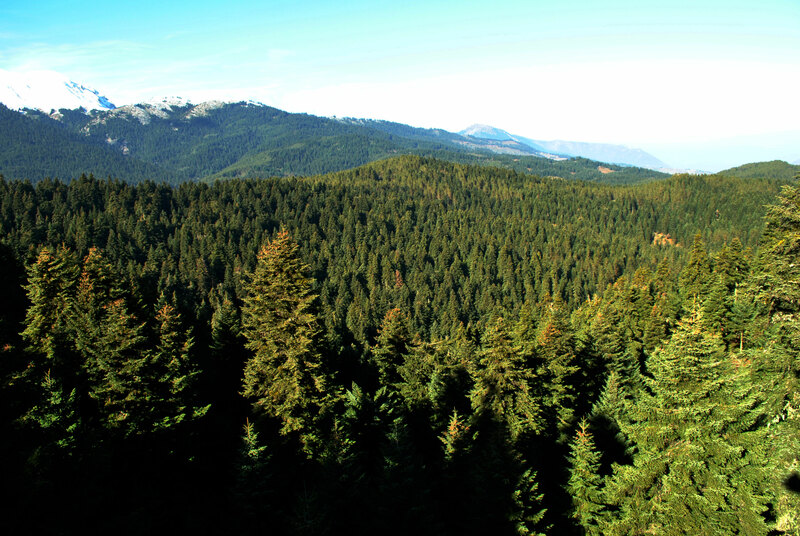 Don’t just admire the view from the car; let yourself explore on foot or bikes the area especially near the ski centre where you will find many off road roots and paths and enjoy the heavy forest! 6. 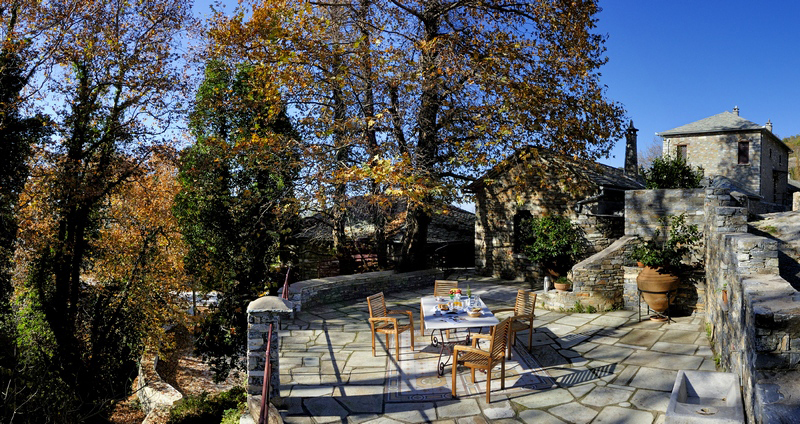 A restaurant that you should really visit when you are in this area is called “Ta Kanavia” and it is located in Elati. 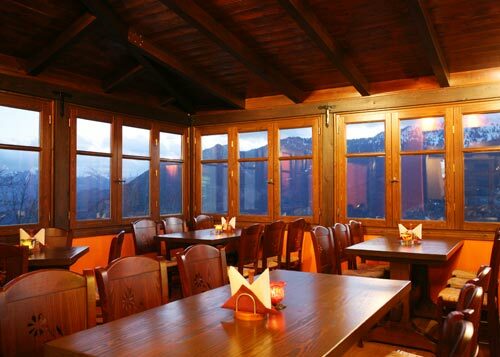 Excellent spot overlooking the area and the mountain opposite to Elati, amazing food comprising of well prepared and served firsts and amazing main dishes with many choices on hunting and traditional dishes. The wine is also excellent! 7. 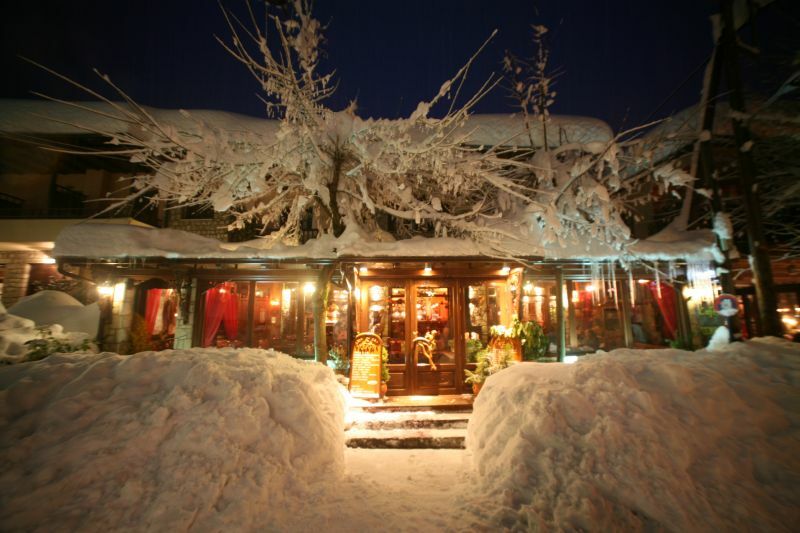 Downtown Elati you will also find “To Kechri”, beautiful cafe where you can enjoy relax and enjoy a hot chocolate in a cold winter day! You should really try the homemade cherry spoon sweet which is absolutely delicious! 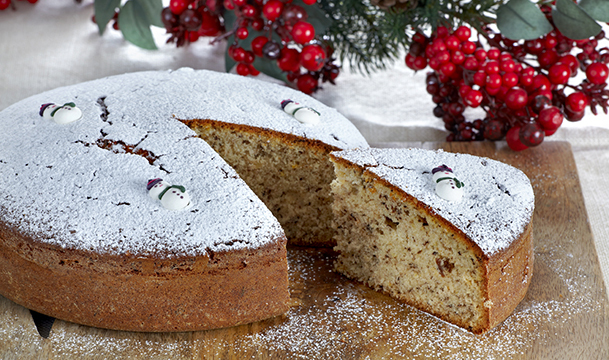 The New Year Cake, or Vasilopita for the locals, is a round cake or tsoureki (something similar to the French brioche) that is served after the New Year festive meal. What makes it different from a normal cake is a coin hidden inside. The cake is cut in equal pieces, one for each convive, and whoever finds it is considered to have good luck for the new calendar year. Another quintessential Greek holiday cookie is kourabies. 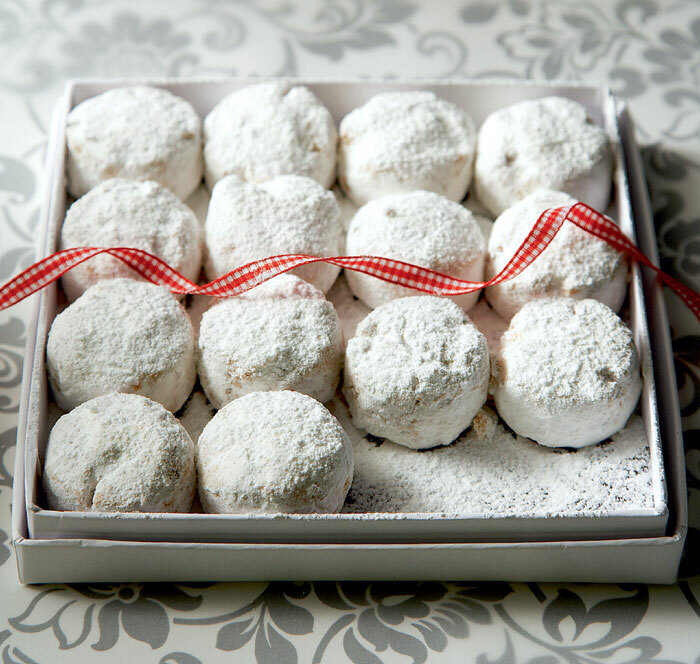 Kourabiedes (plural) are butter cookies with brandy and crispy roasted almonds hidden under a veil of powdered sugar. An ideal treat for every hour of the day, especially next to a hot cup of black coffee by the fire. 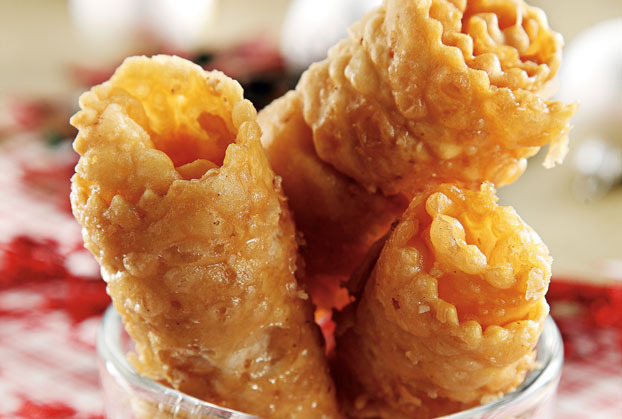 Diples are deep-fried thin sheets of dough usually given the shape of a roll or a bow. They are then drizzled with honey syrup and sprinkled with cinnamon, clove and ground walnuts. 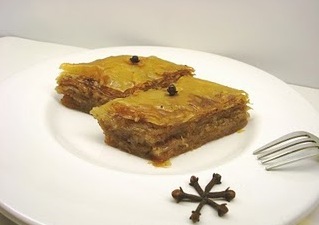 Diples are a typical dessert in the Peloponnese and Crete (usually called xerotigana) and apart from the Christmas holiday season are also served at traditional weddings or special occasions. Traditionally, Baklava is made with nuts and butter. 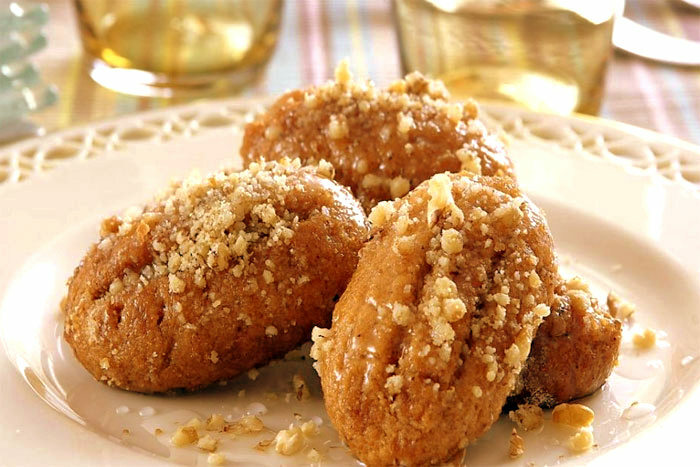 In this special Christmas dessert from Thrace, nuts are replaced with sesame and butter with olive oil, making it appropriate for the Greek Orthodox fasting period. 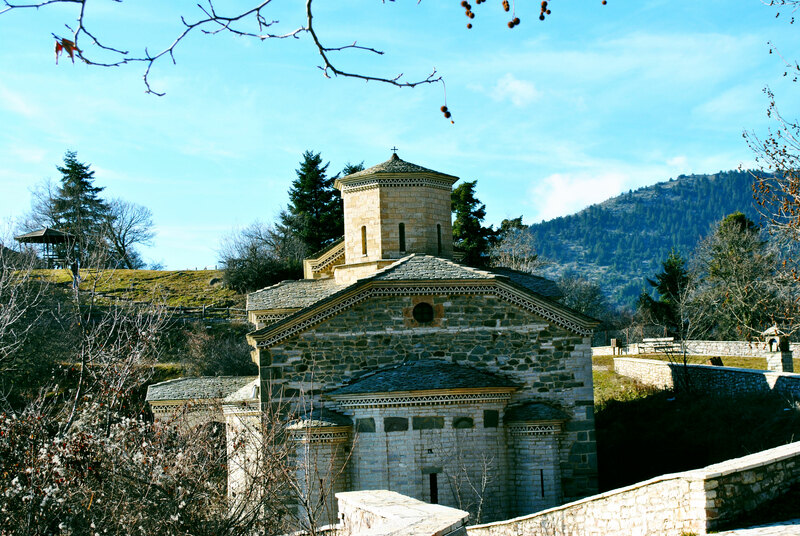 A delightful alternative you must absolutely try if you visit Thrace! Pork is the Greek turkey; in most parts of Greece, pork is traditionally served on the Christmas table in various forms (most commonly roasted). 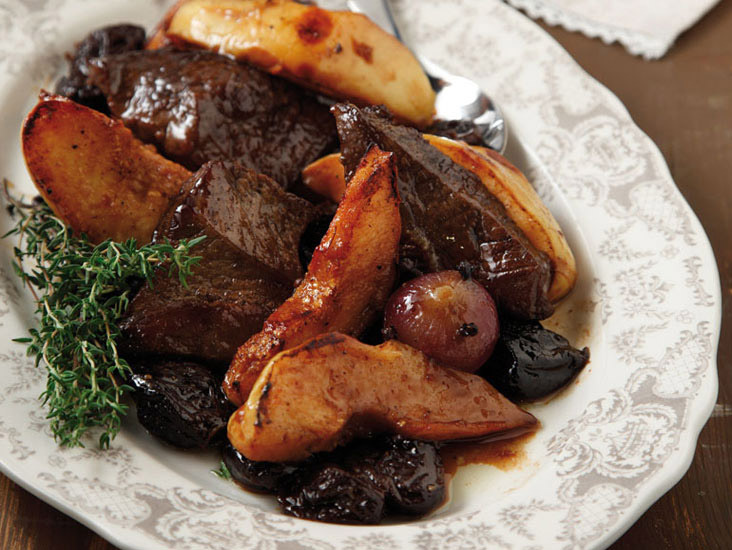 My personal favourite is the slow-cooked pork casserole with quince and prunes. With the sour taste of the quince deliciously complementing the sweetness of the prunes, this sauce gives a whole new dimension to pork. An absolute must! In the Greek tradition, pomegranates symbolize wealth, good luck and fertility. This is why Greeks crack a pomegranate in their house entrance every New Year’s Eve, and use it in various Christmas dishes. 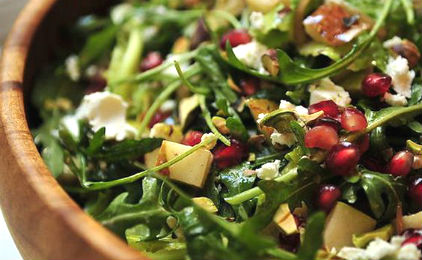 Our suggestion would be pomegranate, goat cheese, greens and walnut salad. 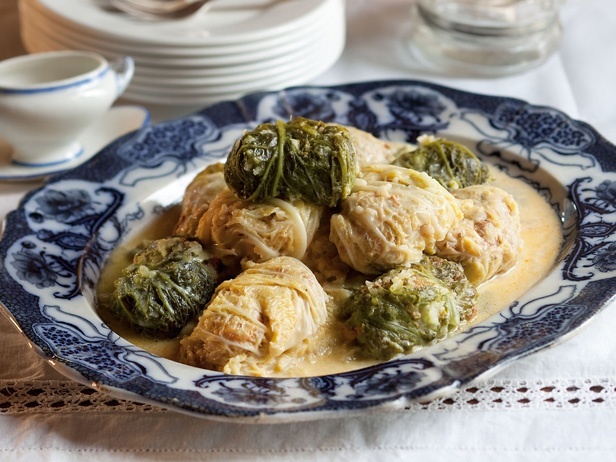 This traditional dish is cabbage leaves stuffed with minced meat (beef & pork) and rice, covered with a deliciously rich egg & lemon sauce. It is said that lachonodolmas symbolizes baby Jesus in swaddling clothes, this is why it is traditionally served during Christmas. 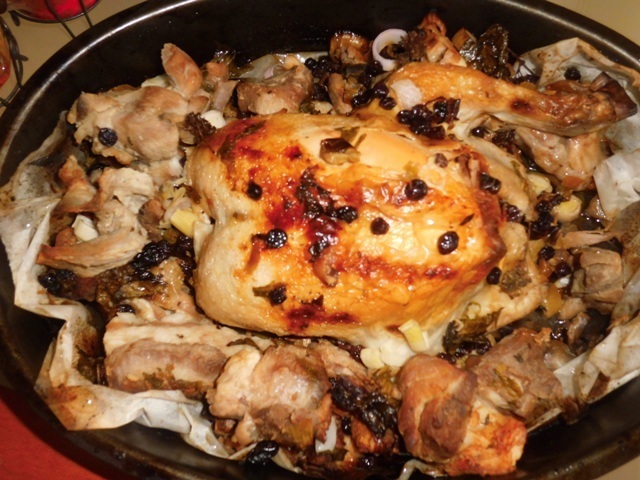 Msoura is a traditional Christmas meat trilogy from Thessaloniki; small pieces of pork, beef and chicken are slowly cooked in the oven and served with rice and vegetables. Christopsomo in Greek means “Christ’s Bread” and it is an ornate bread loaf traditionally made by women at Christmas Eve and served along with other treats on the Christmas table. Although its ingredients are identical to those of your usual loaf of plain bread, its appearance is indeed very different: the dough is given a round or bagel shape and it is then decorated. 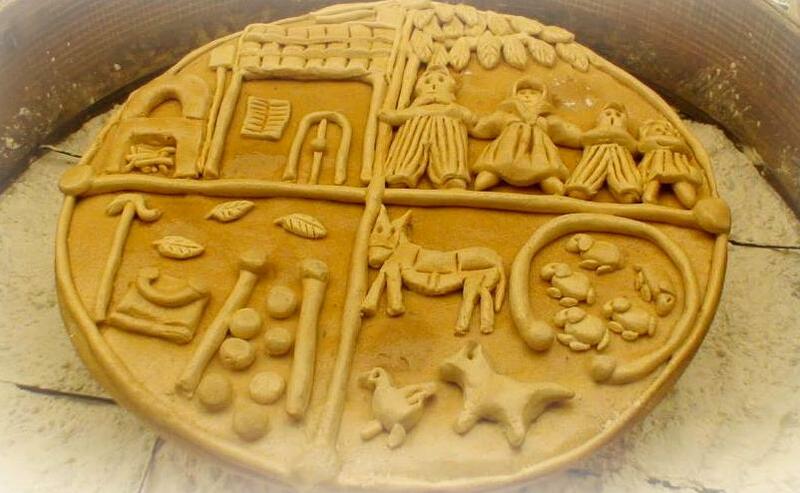 Every decoration has its own symbolization; a capital B, cow or plough symbolize the traditional agricultural works, a house symbolizes a wish for good luck for the whole family, and vine leaves and olive leaves stand for the wish for a mild winter and warm summer. 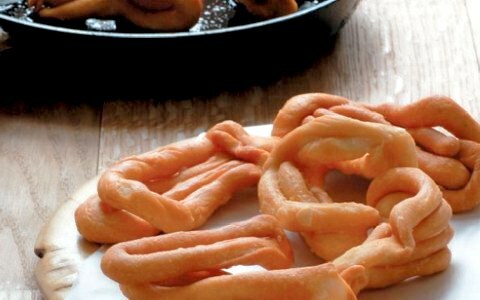 Lalaggia are crispy fried dough strips usually served in Messinia. Depending on the region, they can either be sweet (seasoned with cinnamon and cloves) or savoury (plain or seasoned with star anise). Although they were initially a Christmas tradition, you can now find them all-year long in almost every Messinian bakery. Make sure you buy the large bag, because despite their looks, they are absolutely irresistible! Tip: Ask for the soft ones rather than the hard type.